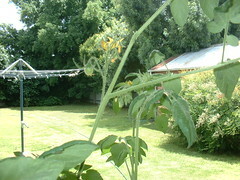 Here's pic of one of the tomato bushes that I planted in a wicker basket. I'm very happy that there are now little tomatoes, and plenty more to come judging by the number of flowers on the plant. I'm working at home today on my Uni website. I'm building up an online subject that is running in Semester 3 (now). I have three modules in the subject and I'm half way through the second. this one is on methodologies and today I'm working on information and activities about ethnography and grounded theory. To finish off the ethnography, I've made some notes and recordings from two ethnographies. One is by Philip Jackson (1968) and is titled Life In Classrooms. The second is by Harry Wolcott and is titled The Man in the Principal's Office. I've enjoyed reading both and I hope that the students will enjoy the snippets that I'm drawing on, including short segments that I have read aloud and commented on. I'm making good progress by doing a fair bit of work and then running out to check on my tomatoes and other veggies. I also have a very nice eggplant (with one flower) and several zucchinis. I'd be thrilled if I could actually get some zucchinis because I battled snails with the seedlings. Fingers crossed that snails have new retreated. BTW, I didn't use poison pellets to fight them off. I used crumpled up eggshells and they seemed to do the trick.